Big Trev's Pty Ltd - Carpet Cleaning Currambine provide a range of Carpet Cleaning services to customers in Currambine and the surrounding area, such as wet carpet restoration, rug cleaning - on and off site, fabric sofa cleaning, mattress cleaning and carpet protection. We have the perfect Carpet Cleaning solution for you! Big Trev's Pty Ltd - Carpet Cleaning Currambine have over 15 years of experience providing quality Carpet Cleaning and associated services to both residents and businesses throughout Currambine. We, at Big Trev's Pty Ltd - Carpet Cleaning Currambine, specialise in all types of Carpet Cleaning for both commercial and domestic customers as well as other services which are listed below. If you are looking for a reliable, experienced and customer focused Carpet Cleaning company in Currambine to assist you, speak to one of our friendly staff members at Big Trev's Pty Ltd - Carpet Cleaning Currambine today. 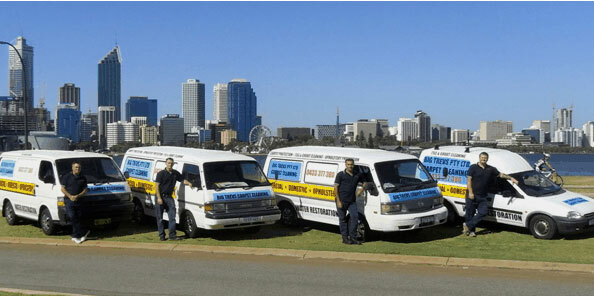 Why Choose Big Trev's Pty Ltd - Carpet Cleaning Currambine? Big Trev's Pty Ltd, Carpet Cleaning Currambine deliver a quality service at affordable prices to all potential new clients. At Big Trev's Pty Ltd, Carpet Cleaning Currambine, our focus is delivering high quality Carpet Cleaning service at a competitive price to all our customers in the Currambine area. If you are looking for a friendly and reliable Carpet Cleaning provider at an affordable price, give Big Trev's Pty Ltd, Carpet Cleaning Currambine a call today!